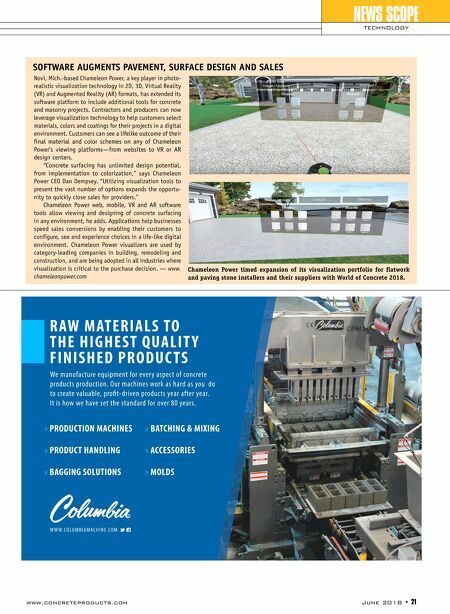 20 • June 2018 www.concreteproducts.com GV (formerly Google Ventures) and Home Depot recently led a $25 million funding round for San Francisco-based Hover, whose technology generates interactive 3D models of any property using smartphone camera-derived image files. The platform, Hover officials contend, is a) revolutionizing how home improvement projects are estimated and sold; b) saving exterior contractors time and money on every project, and help- ing them close more business; c) affording homeowners simple inter- face and in-depth design features so they can comprehensively visu- alize their exterior projects; and, d) providing insurance industry users up-to-date property measurements to reduce claim adjusting costs. "Americans spent well over $300 billion on home remodeling last year, yet when it comes to the most important and fundamen- tal part of the process—getting estimates to make an informed decision—homeowners are still subjected to the same process their grandparents went through: rely- ing on measuring tape, handshakes [and] eye-balled estimations," says Hover founder and CEO A.J. Altman. "We're excited to continue to work alongside these amazing strategic Google, Home Depot back building enclosure visualization developers Hover app users are directed to take at least eight images of every angle of a home. The software automatically uploads files from the smartphone camera, then transforms images into a fully mea- sured, customizable and interactive 3D model. 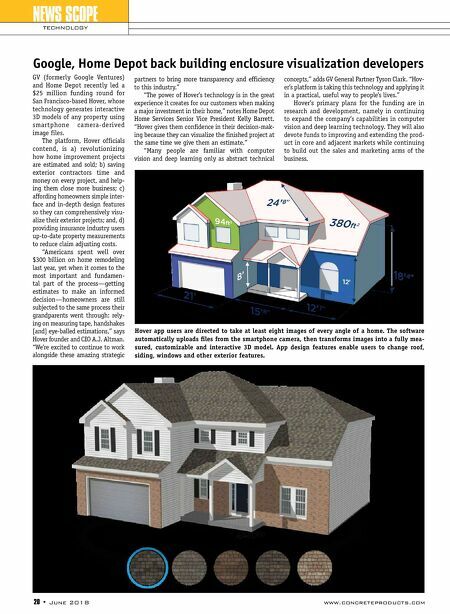 App design features enable users to change roof, siding, windows and other exterior features. NEWS SCOPE TECHNOLOGY partners to bring more transparency and efficiency to this industry." "The power of Hover's technology is in the great experience it creates for our customers when making a major investment in their home," notes Home Depot Home Services Senior Vice President Kelly Barrett. "Hover gives them confidence in their decision-mak- ing because they can visualize the finished project at the same time we give them an estimate." "Many people are familiar with computer vision and deep learning only as abstract technical concepts," adds GV General Partner Tyson Clark. "Hov- er's platform is taking this technology and applying it in a practical, useful way to people's lives." Hover's primary plans for the funding are in research and development, namely in continuing to expand the company's capabilities in computer vision and deep learning technology. They will also devote funds to improving and extending the prod- uct in core and adjacent markets while continuing to build out the sales and marketing arms of the business.